We have on staff a “Unique Lighting Certified Designer”. Landscape lighting is an art and one we have perfected. We have installed low voltage landscape lighting in Evergreen and the surrounding communities of Golden, Genesee, Conifer and Morison for 15 years. Our approach is to use lighting in a soft and artful way, installing lighting accents and avoiding the airport runway look you will get from a novice installer. Landscape lighting and design requires a seasoned professional who understands the use of light and bringing light in a soft and tasteful way into a landscape. It is easy to install a flood light or just point high wattage down lighting and path lighting about a landscape. We have removed and replaced broken lighting systems purchased from Home Depot and installed by a “professional” countless times. That’s not the correct way to install landscape lighting. Low voltage landscape lightingshould be soft and even, adjusting wattages to specific circumstance or elements in a landscape. Lighting should be ambient, using low voltage lighting fixtures, reflective light, and concealing direct white light. 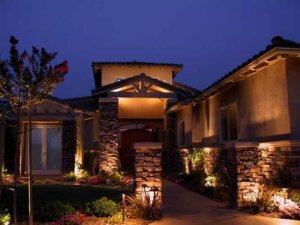 We design low voltage landscape lighting for Evergreen, Genesee, Conifer, Golden, Morrison and the Denver Metro communities. The most recent advancement in landscape lighting is the use of LED. Evergreen Landscape & Design uses the latest in landscape lighting technology. We install the new 24 volt LED systems by Unique Lighting. These systems give controls over the low voltage lighting system never seen before in the industry. Additionally, they use an astonishingly low amount of energy and provide a bulb life that’s unsurpassed. Customers can control the system by zones, having individual zones turn on and off at specific times, and the systems can control holiday and Christmas lighting as well. Our low voltage landscape lighting systems are available with a lifetime equipment warrantee. That’s the confidence we have in landscape lighting installations with Evergreen Landscape & Design and Unique Lighting Systems.